Few names are as noticeable in the UM baseball annals as Stanley "Skip" Bertman. A former assistant coach with Ron Fraser's Hurricanes from 1976-1983, he has enjoyed success wherever he has been. While at UM, he helped lead the Hurricanes to the NCAA playoffs in all eight years he was on the staff, including winning the College World Series Championship in Omaha, Nebraska in 1982. 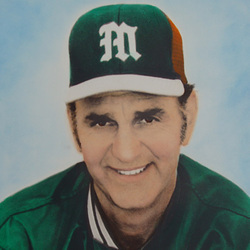 Bertman, a native of Miami Beach, was the associate head coach on that squad, and was considered one of the best pitching coaches in the country. In 1984, he moved on to become the head coach at Louisiana State University, where he would win the College World Series in 1991, 1993, 1996, 1997 and 2000. He would retire after the 2001 season, with 11 conference championships and holding the highest winning percentage in SEC history ! He would serve as the Tigers athletic director until his retirement in 2008. He also would win a gold medal with the 1988 Olympic team as its pitching coach, and was head coach of the bronze medal winning team in 1996 in Atlanta. Bertman holds the distinction of being the first UM baseball coach to have his number retired. Skip was quite a success as a player, as well, earning three letters (1958-1960) as a catcher and outfielder with the Hurricanes. In 2006, Skip joined his former boss, Ron Fraser, as a member of the College Baseball Hall of Fame's Inaugural Induction Class. In October 2010, Skip was given the Greater Miami Chamber of Commerce's "Lifetime Contribution to Sports" award.